A teenage girl was hit by a ride-on lawnmower during the morning rush hour. 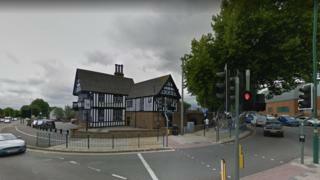 The girl, a pedestrian, was hit by the machine at 07:51 GMT on Bristol Road South close to the Black Horse pub in Northfield, Birmingham. She was treated at the scene and taken by ambulance to Birmingham Children's Hospital. Her injuries are not believed to be life-threatening, West Midlands Ambulance Service said. West Midlands Police said it was also called to reports of a pedestrian being hit by the lawnmower. There were no serious injuries, a force spokesman said.